Our junior highs will become a middle schools next year - serving sixth, seventh and eighth graders. The school board recently approved Oak-Land Middle School and Stillwater Middle School as the schools' official names, beginning next fall. But our names aren't the only thing changing. Our new middle school program will offer our students the very best in academic, social and emotional support and personalized learning. Learn more. Parent meetings for next year's 6th and 7th graders will be held in January. Watch for information coming soon. 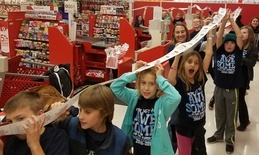 Stillwater Area Public Schools' students came together in a big way to help those less fortunate during the holidays. Schools across the district collected donations - from food and clothing to toys and books. Read more. A life-size ice sculpture of Da Vinci’s Vitruvian Man, an on-the-spot community art project depicting the new bridge, and a spoken word area featuring student poetry and dramatic improv are the new features of this year’s Da Vinci Fest. The 9th annual celebration of art and science is sponsored by The Partnership Plan and Stillwater Area Public Schools. The free event will be held on Jan. 7, from 1 to 5 p.m. at Stillwater Area High School. Read more. Congrats to the St. Croix Valley Area Learning Center for earning 9th place in the Minnesota Association of Alternative Programs' Elympics competition! More than 40 teams took part in the online logic and trivia contest. See more photos on our Facebook page. It's cold outside - and a good time to review the school district’s winter weather procedures on our website for more information about school closings, delays or early releases. There are no magic numbers regarding temperatures, amount of snows, wind chills, or other factors to help guide a decision to close school. The decision is largely based on the ability of school buses to travel the roads safely and the conditions bus riders will face while waiting for the bus. Parents always have the option during inclement weather to keep their children at home. There will be no school penalty and/or consequences for this choice -just make sure to contact the school with their intentions so we know students are accounted for and safe. The Community Education winter catalog goes live online Monday, December 19. We have lots of fun activities for kids and 24 new adult classes to choose from! Sign up on Feepay. Have a safe and happy winter break! There will be no school Dec. 23 - Jan. 2. We wish you all a relaxed and joyful time away, and look forward to welcoming students and staff back to school on Tuesday, Jan. 3. Check out digital Backpack for information about youth sports, activities, clubs, events and more! You'll also find resources for families in need of free/low cost food, medical care and more.